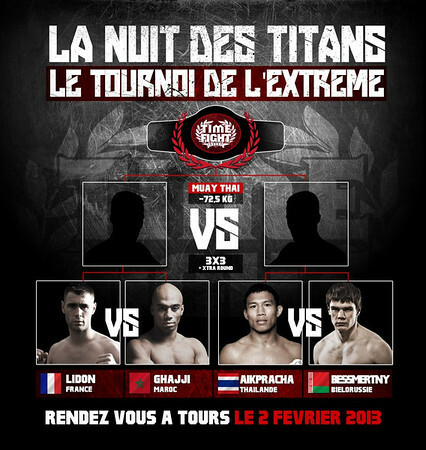 More updates are still emerging from the February 2nd, 2013 scheduled card for La Nuit des Titans. In addition to the normal 5 round, 3 minute round bouts there is now a 4-man tournament announced. 2. Yuri Bessmertny(Belarus), Belarus Fight Code champion vs. Aikpracha (Thailand), current champion of Lumpinee stadium. The two semi-finals and finals will take place in a 3 rounds of 3 minutes each format. The prize on the line will be the Time Fight belt. At the moment the main event fighter Fabio Pinca is as of this writing still without opponent so it should be interesting to see who Fabio will ultimately face during La Nuit Des Titans 2013. 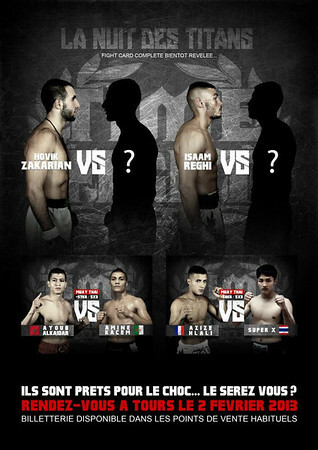 Also without opponents for the coming card is Isaam Reghi and Modvik Zakarian. The rest of the fighters do apparently have opponents now named. Ayoub Al Kaidar will fight Team Naser K fighter Amine Kacem. At this point Team Naser K has to be one if not the winning-est team of Thaiboxers from France and perhaps Europe. Earlier in October Naser K team member Dylan Salvador scored a TKO win over Thailnd’s Saiyok. The other scheduled non-tournament bout will see Aziz Hlali fight Super X of Thailand. While it is still early in the card development, the 72.5 kg tournament gives fans much to be excited about especially with the inclusion of Thai fighting star Aikpracha still involved. ~ by fatsoking on November 30, 2012.